HORIBA Scientific, global leader in Raman instrumentation and other spectroscopy solutions, announces the organisation and sponsorship of RamanFest for the seventh consecutive year. Since its launch in 2013, RamanFest has become one of the leading international events in the field of Raman spectroscopy. This year, HORIBA UK Limited has the honour to organise the 7th International Conference on Advanced Applied Raman Spectroscopy. It also marks the 200th anniversary of HORIBA's spectroscopy expertise. 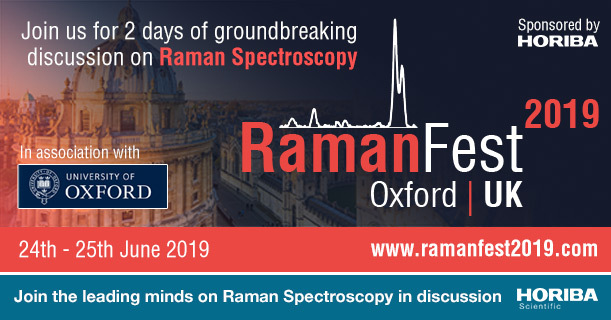 The two-day conference will be held in Oxford Martin School, Oxford UK from 24 to 25 June 2019 and will together the world-leading Raman experts and researchers to discuss how Raman spectroscopy is being applied to today’s problems and pioneering tomorrow’s capabilities. The Conference will be hosted by Prof. Wei E. Huang of the Department of Engineering Sciences, University of Oxford, UK. Topics will cover a broad spectrum of Raman applications across the major themes of Health and the Environment, Materials Analysis, and TERS Nanoscale Raman. A Gala Dinner will be held in Oxford Town Hall and a poster session will run throughout the Conference. Dr Simon FitzGerald, Technical Manager at HORIBA UK Limited, and local organiser of RamanFest comments: “Since the first RamanFest seven years ago, this conference has quickly established itself as the leading conference dedicated to applied Raman, illustrating the progression of cutting-edge research to real-world applications. The roster of speakers for this year speaks for itself – we are honoured to have world-leading experts coming to present their work and promote discussion on this fascinating and powerful technique. Registration is required, and seats are limited. HORIBA Scientific is a world leader in OEM Spectroscopy, elemental analysis, fluorescence, forensics, GDS, ICP, particle characterization, Raman, spectroscopic ellipsometry, sulphur-in-oil and water quality measurements as well as XRF. Our instruments are found in universities and industries around the world. Proven quality and trusted performance have established widespread confidence in the HORIBA Brand.